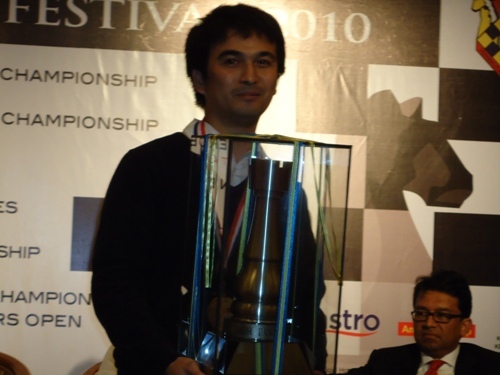 Grandmaster Cao Sang of Vietnam emerges winner on tie break after nine grueling rounds in 7th IGB Dato’ Arthur Tan Malaysia Open 2010 in Kuala Lumpur. Cao Sang, GM Zhou Weiqi of China and IM S.P.Sethuraman have all scored 7 points but finally Cao Sang was declared winner on Bucholz tiebreak. GM Cao Sang performed at 2647 level and was consistent throughout the tournament. Instead of taking “agreed draw” in the last round against his fellow countryman GM Nguyen Anh Dung he made an extra effort and finally won the battle. At the end he was rewarded with a beautiful trophy and the winners purse of US$4000 since there were no sharing of prizes. 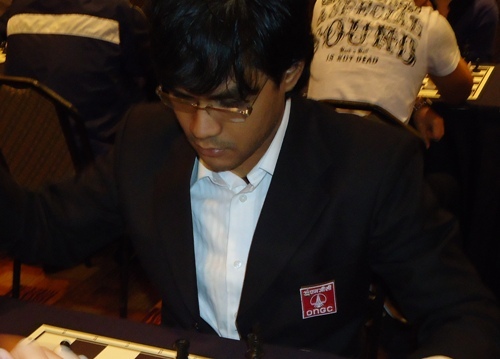 IM Nguyen Van Huy also from Vietnam obtained a GM Norm with a 2604 Rating performance. Besides 7 others achieved their IM Norms. Worthy of mention was Guo Qi a young talented girl from China who increased 63 elo ratings only to be unfortunate at the end by losing last 2 games. She defeated many strong players and secured an IM Norm. As expected GM Dimitry Kayumov of Uzbekistan won the event with ease as his nearest rival runner-up Gross Ronald Joseph of USA is 1.5 points below. Magdalaga Luffe of Philippines and Kant Rupesh of India both scored 7.5 points and tied for 1st but finally Luffe won the event on better tiebreak. As per the tradition of the festival in the final day there was a Blitz (with timings 5 minutes each without any increment) tournament. It was a 9 game swiss as qualification for the top 8 players who will play knockout matches consisting 2 games each. IM Khamrakulov Dzhurabek of Uzbekistan kept his nerve until the end to win the Malaysian Open Blitz title after beating Chinese GM convincingly (2-0) in the Final. logical results and would be much thrilling for spectators to watch. The main sponsor of the event 75-year old Mr.Dato was present in the closing ceremony which was brief and well organised. Mr Dato Tan Chin Nam is a chess philanthropist and a great lover of the game who has been sponsoring the event for a long time and without his support such an event would not have been possible for so many years. The function ended with a hope to meet in next years tournament in the same place.